In the broader sense, community paediatrics encompasses this non-hospital, family oriented philosophy, but the provision of care to acutely sick children at home is not developed that well in most community paediatric units. Therefore, to avoid confusion, I have limited community paediatrics, in this article, to include (a) preventive care including child health surveillance and the monitoring of this, and (b) the management of children with special needs and all that entails, including tertiary care. These two major functions of community paediatrics are well defined and well developed, as is hospital paediatrics. What demands further development is ambulatory care, whether community or hospital based. Good links with the primary care team are essential for an ambulatory service to function. More sick children are going to be cared for at home, and general practitioners (GPs) and their teams need to be aware of this and of where the primary and secondary care roles overlap. Fewer children are going to be followed up at the hospital and the GP must have confidence in the local paediatric team and know he or she has easy access to their specialist advice when it is needed. Strong links with the GP are fundamental to an ambulatory service, and ensuring they are in place is a priority for the ambulatory paediatrician. Our department has achieved this by becoming very responsive to the GP in the following ways. Firstly, we make ourselves available to the GP by publishing direct phone lines and operating a ‘hotline’. We have a short wait for routine outpatient clinics and urgent cases are seen within 24 hours by a consultant. Consultants use structured letters for discharge summaries and outpatient letters as this has been shown to improve communication with GPs.7Outreach clinics are another way of improving links with primary care; in particular, those that involve close liaison between the GP and paediatrician during the consultation. I currently undertake two outreach clinics, both of which involve close liaison with the GPs and both are highly enjoyable and feel worthwhile. Children’s nurses who are prepared to work outside the conventional setting of the hospital and take care into the homes of children, and who are willing to extend their role, are fundamental to a thriving ambulatory service. The ambulatory paediatrician must work closely with the home care nurses, offering support and advice. The home care nurses must have ready access to both outpatient and inpatient facilities when they need them. A survey of paediatric home care in the UK found that most paediatric home care services are small.8 In January 1993, there were 62 general and 124 specialist home care nursing services, with an average of 2.5 whole time equivalents (WTE) in general, and 1.3 WTE in specialist services. Since 1994, we have had six G grade children’s nurses in our home care team, funded from within the acute paediatric budget. They provide both a general and specialist service. This is achieved because each of the nurses takes a lead in a particular area, for example diabetes, asthma, oncology, yet all nurses look after the whole range of clinical cases. Working in this way provides greater flexibility and, I believe, is the preferred model, particularly as many children looked after at home have short term nursing needs that do not fit easily into any particular specialty, for example children with burns for regular dressings, children on home traction, children who have severe gastroenteritis being managed at home on oral rehydration. Our home care nurses take referrals from the accident and emergency department and our day assessment unit, so preventing admissions, as well as providing an early discharge facility for children on the general and neonatal wards (for example children home on intravenous antibiotics once well, preterm babies home on tube feeding, babies with chronic lung disease on home oxygen). The accident and emergency department, the outpatient department, and day units or short stay facilities, where set up, are the main non-inpatient services. It has been estimated in a recent audit of children’s services that one child in four in the population attends accident and emergency in any one year.6 It is essential that this service is efficient, effective, and child and family oriented. In our district general hospital, over 20 000 children are seen in the accident and emergency department every year (at least 10 times as many children as are admitted to the wards). Many of these children are seen by accident and emergency staff and not by the paediatric team. Strategies introduced to improve the care given to these children include the production of clear guidelines on the management of common conditions and easy referral to the paediatric team. The liaison health visitors go through all children’s accident and emergency cards daily and refer any possible problems to me. There are combined audit sessions, and regular meetings with the accident and emergency consultants and charge nurse. The presence of trained children’s nurses makes a huge difference to the care of children in the accident and emergency department, and is advocated in many documents.10 There is considerable potential for the role of these nurses to be extended so they see, treat, and discharge patients without any medical involvement. Nurse practitioners are already working successfully in some children’s hospital accident and emergency departments. The ambulatory paediatrician must work with the accident and emergency department to ensure that adequate training is given to staff so the quality of care for children is maintained, and national guidelines are followed. The outpatient clinic should offer quick and expert consultation for the general practitioner. The ambulatory philosophy to keep children at home or in their local environments means that children should not keep coming back to outpatients when they could be cared for by their GP. There is no obvious place for an outpatient visit to find out that the diagnosis made at the last visit was correct and the treatment has worked, nor for the patient to return for results, particularly if these are normal. 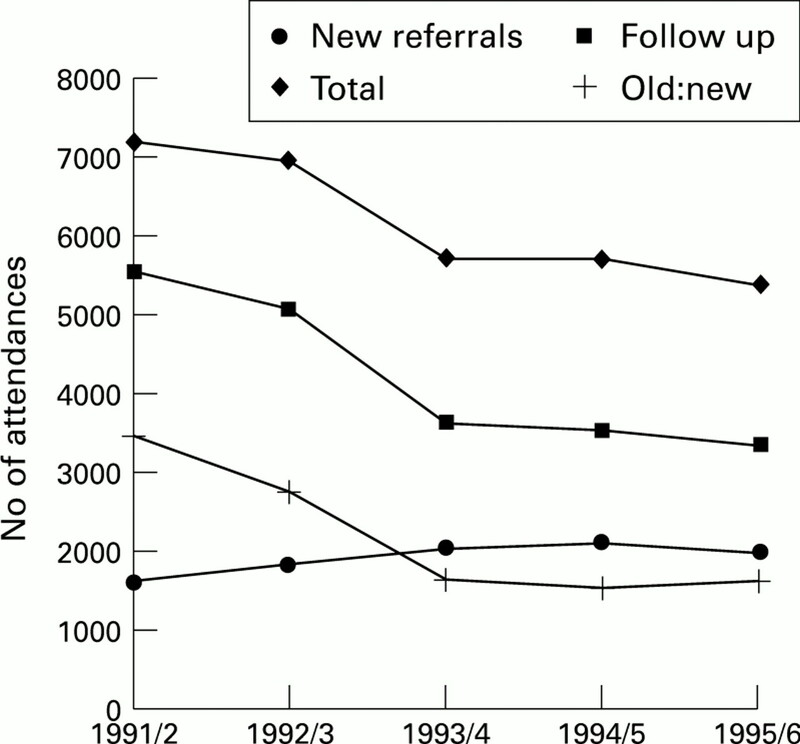 By reducing such follow up visits, the waiting time for new patients can be brought down to two to three weeks and more new patients can be seen.11 We have reduced our follow up:new referral ratio from 2.8 in the 1992/3 year to 1.7 in 1995/6, and by doing so have increased the number of new referrals seen (see fig 1, old:new represents the follow up:new referral ratio and has been increased by a factor of 1000 for the purposes of display). The result is a short wait for new referrals so the GP gets a response quickly, and the parents do not have a long anxious wait to see the ‘specialist’. This also means that children who have been seen and who are having continuing problems can be seen again quickly, as can those who have had tests which show abnormal results. Some children do require follow up but these constitute a minority. The whole emphasis is changed from what is convenient to the doctor to what is convenient for the child and family. 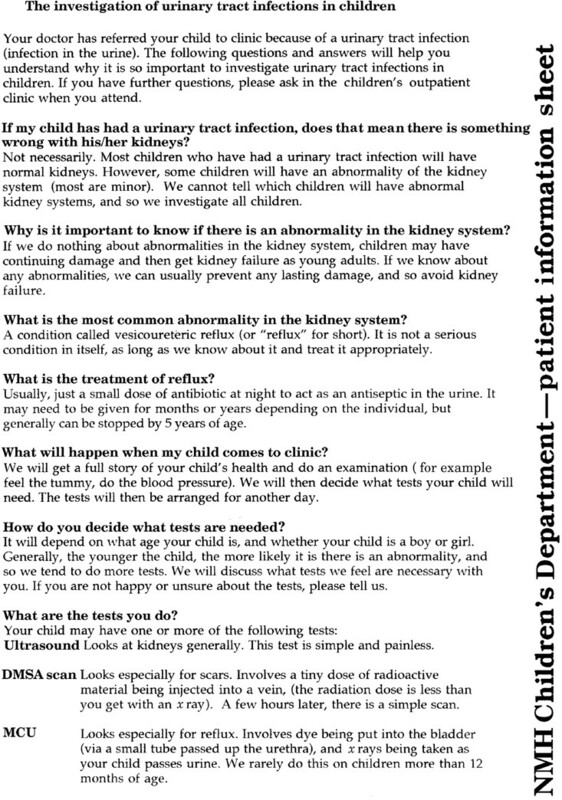 North Middlesex Hospital (NMH) Children’s Department patient information sheet. Having a short wait for routine new appointments is only one step. The second is to have a clinic for urgent problems or a ‘rapid response’ clinic. There are many versions of such clinics. The important thing, I believe, is not to let the clinic become a primary care facility, which is not the function of a hospital secondary service, or a way of bypassing the waiting list, which is not necessary if there is only a short wait for all new patients. We have achieved an urgent clinic which is manageable and consultant led, in conjunction with a telephone hotline. There is a consultant paediatrician available for one hour per day solely to take calls from GPs regarding problems. If the problem is urgent, an appointment is given for that day. Another function of the hotline is to provide the GP very easy access to a specialist opinion, further strengthening links with the primary care team. There were 260 calls in the first year of operation of the hotline (an average of just over one call per day). Forty four per cent of calls resulted in an urgent appointment, 24% in a routine appointment, and 21% of calls were dealt with over the telephone, thus reducing the need for the child and family to attend the hospital. There were 118 attendances at the urgent clinic over the first year, an average of one child every two days. The children were seen by a consultant in 78% of cases and always by a doctor of at least registrar grade with consultant supervision. Eighty two per cent of the attendances were felt to be appropriate urgent cases (M A Meates. Telephone ‘hotline’— improving the quality of an urgent clinic[abst]. Proceedings of the British Paediatric Association Annual Meeting 1995;67:25). The hotline continues to be popular with local GPs and the urgent clinic remains consultant led and manageable with approximately 2–3 patients per week. In June, 1995, a day assessment ward was opened, operating from 0800 to 2030 hours, Monday to Friday, staffed from within the general paediatric ward nursing and medical complement. An area adjacent to one of our inpatient wards was identified and, with a small injection of capital, the necessary changes were made to provide us with our day unit. The day assessment unit was primarily set up to (a) provide an area where children could be assessed prior to the decision being made to admit, as it was felt by staff that some children who were admitted needed hospital care for only a very short time, (b) provide an area for children requiring investigations away from the hustle and bustle of the acute ward, and (c) provide an area for direct access for GP referrals instead of these children being sent to a busy accident and emergency department. The primary outcome expected was an improvement in the quality of the service that we provided, because, although we expected to prevent a number of children being admitted, we did not necessarily expect a reduction in admissions overall, as our general impression was that we are seeing more sick children. Certainly, if admissions for sickle cell disease are used as a control group, as we have a policy of admitting all of these, our admissions have gone up in the last year. We looked at two three month periods (July to September—our quietest period, and November to January—our busiest period) and compared medical admission data before and after June 1995, looking specifically at conditions we thought may be influenced by the day assessment unit, such as respiratory disorders (including asthma), gastroenteritis, the febrile unwell infant, and febrile convulsions (see fig 3). A reduction is shown in all categories except respiratory illness and febrile convulsions during the winter months, but the reductions had started before the 1995/6 period. We believe the reductions seen in the 1994/5 period are due to the ambulatory service provided by the children’s home care nurses (who were fully staffed at six during this time, although a smaller team had been operating for some years before). The only difference between the service in the 1994/5 and 1995/6 periods is the opening of the day assessment unit, and the classification system used. In the 1995/6 period the International Classification of Diseases, 10th revision was used where previously the ninth revision had been used, but this would not affect total numbers, and we matched diagnoses in the particular disease categories to reduce any bias. We have a policy of admitting first febrile convulsions, and were surprised by the reduction in admissions during the summer months; we need to look at this in future years to know if it is a real trend. Admissions in (A) July to September and (B) November to January. Over the past three years that we have available accident and emergency data, attendances have not declined, and may have even increased (see fig 4). 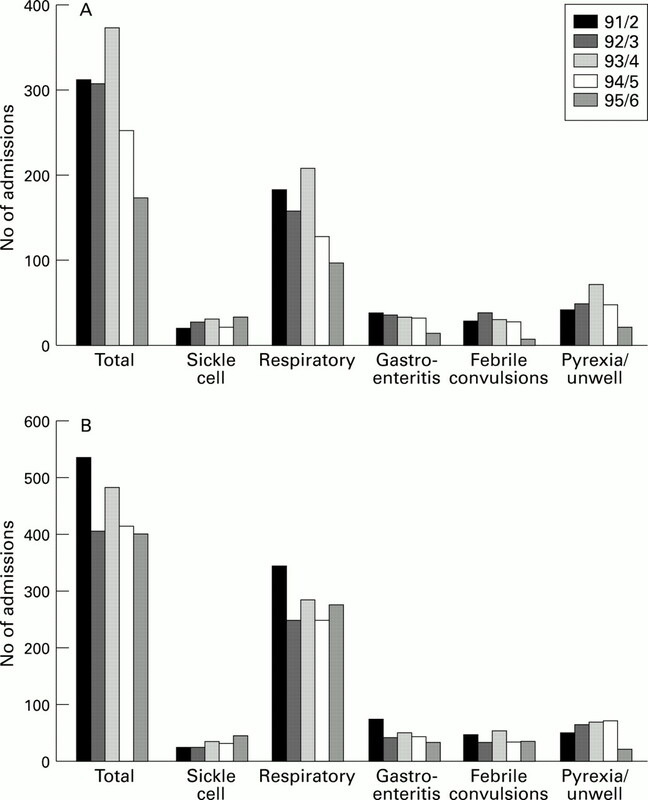 Figure 5 shows the proportion of children attending the hospital with a particular condition who were admitted. It can be seen that for respiratory illness, gastroenteritis, and the febrile unwell child there have been reductions in the percentage admitted during both three month periods, despite the actual number of respiratory illness admissions in the winter not showing any decline. 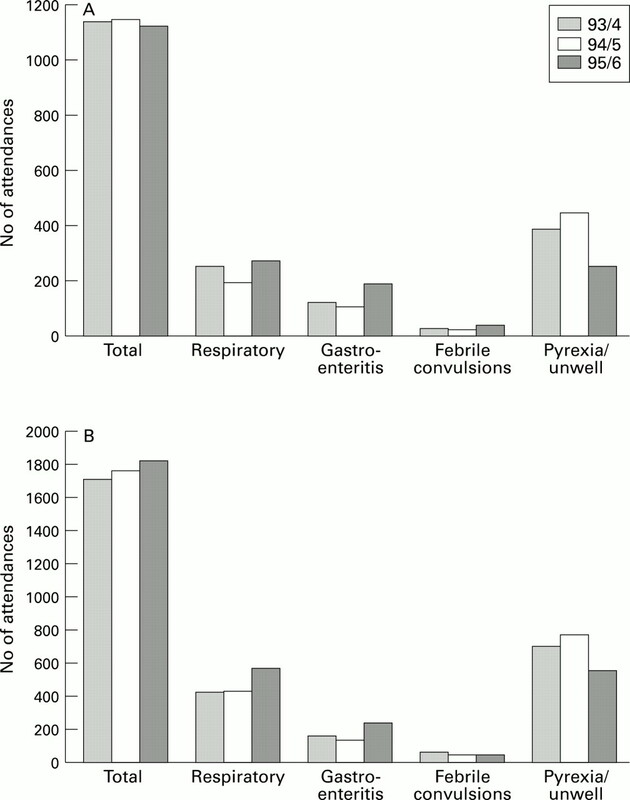 With regards to the febrile unwell child (depicted as the pyrexia/unwell group), attendances before 1995/6 were taken from accident and emergency and after 1995/6 were the sum of accident and emergency department attendances plus direct GP referrals to the day assessment unit, so the denominator for this group is smaller after 1995/6 (because the coding in the day assessment unit tends to be more specific), thus minimising the real effect of the reduction of admissions due to the day assessment unit in this group. I believe these later figures show that the day assessment unit has allowed a reduction of admissions, an added bonus to the improved quality of care. Attendances in (A) July to September and (B) November to January. Children (%) admitted in (A) July to September and (B) November to January. There are many possibilities for working more closely with the community paediatric services. There are many changes occurring in community paediatrics with surveillance now being undertaken by GPs and school medical examinations becoming more selective. The role of the clinical medical officer is also changing—they could take a special interest, as already many do, in particular problems, such as enuresis, behavioural and feeding problems. Instead of these problems being seen in the hospital outpatient clinic, they could be seen in the local child health clinic, thus reducing the medical/abnormal aspect of the problem. The parents may well benefit from meeting other parents who are experiencing similar difficulties with their children. Obviously, close liaison between the services is necessary to ensure that children who have other problems (for example, UTIs or failure to thrive), are appropriately referred. The follow up of low birthweight babies in a community clinic may be more appropriate than the hospital outpatient department as those babies with special needs are likely to need the services of the community paediatric team, and those without special needs would benefit from being treated like a normal baby from the start. Ideally, babies would see both the neonatologist and the developmental paediatrician in the local child health clinic. Children with chronic problems who require hospital follow up appointments (for example diabetes, cystic fibrosis, sickle cell anaemia), could have some of these coordinated at school, thus minimising time missed from their education. Ideally, a structured format would be sent to the school doctor from the hospital specialist for completion at the school medical, and then returned for inclusion in the hospital notes. Again, good communication between the various arms of the children’s services is essential if this is to work effectively and the ambulatory paediatrician has a key role in facilitating this. Although, this care is not being provided in the home, it is being provided in the child’s own environment, be it at school or the local clinic. Another area the ambulatory paediatrician may become involved in is injury prevention, particularly because of the close links with the accident and emergency department. Strategies for prevention include environmental change and secondary prevention, but for these to be effective, relevant data about the injury is necessary. In the future, we hope to develop an injury database that can generate this information from the accident and emergency record. Ambulatory paediatrics is about having a flexible approach and making the service as child and family oriented as possible, and as such, there is no recipe for setting up an ambulatory service. As a framework, however, the ambulatory paediatrician can bridge the gap between the hospital and community children’s services, concentrate on areas such as accident and emergency and outpatients, work at improving communication with families and the primary health care team, work closely with the home care nursing service, and develop new services such as day units. The development of ambulatory paediatrics seems essential and along with community and hospital paediatrics is part of a combined child health service. From a personal point of view, ambulatory paediatrics is an exciting and challenging area to be involved in, with much scope for development. Not only that, real differences can be made in the service we provide to children, their families and their GPs, with relatively little or no additional revenue; it is the philosophy that counts. I would like to thank Brent Taylor and my colleagues Ben Lloyd, Mary Rossiter, and Arvind Shah for their continued support, advice, and encouragement, Angela Gallagher and the ambulatory nursing team without whom the development of the service would not have been so successsful, Jenny Spencer for her invaluable secretarial support, and Lawrence Pibworth of the audit department for data collection. (1992) Enquiry into London’s Health Service, Medical Education and Research. (HMSO, London) . (Tomlinson report.). (1992) London health care 2120: changes in the future of services in the capital. (King’s Fund, London). (1993) Flexible options for paediatric care. A discussion document. (BPA, August, London). (1994) Ambulatory paediatrics: stepping out in a new direction? [Commentary by K Dodd.] Arch Dis Child 70:339–342. (1993) Bridging the gaps: and exploratory study of the interfaces between primary and specialist care for children within the health services. (Action for Sick Children on behalf of Caring For Children in the Health Services, London). (1993) Children first: a study of hospital services. (HMSO, London). (1993) Use of structured letters to improve communication between hopsital doctors and general practitioners. BMJ 307:1044. (1993) Paediatric home care in the UK. Arch Dis Child 69:677–680. (1994) The paediatric home nursing service at the North Middlesex Hospital. (King’s Fund, London). (1992) Paediatrics in the accident and emergency department. Arch Dis Child 67:560–564. (1993) No more wait and see in clinic. Healthcare Management, April: 50-2..
(1994) Sending parents outpatient letters about their children: parents’ and general practitioners’ views. Quality in Health Care 3:142–146. (1994) How many inpatient paediatric units do we need? Arch Dis Child 71:360–364. (1993) A paediatric medical day unit—10 years’ experience. Maternal and Child Health May:143–147. (1996) Short stay facilities: the future of efficient paediatric emergency services. Arch Dis Child 74:309–313. The wide variation of approach to this ‘ambulatory care’ reflects the diversity of circumstances of populations and their hospital services. Certain aspects are common to all: the ability to see sick children promptly, opportunity for early discharge and appropriate follow up, and good links with the primary health care team. Having a facility designated for acute referrals is valuable especially in large units. Nurses are committed to rapid assessment of children, and are not distracted by duties to inpatients. Improved logistics reduces waiting time to be seen by a doctor. Children can be observed for short periods, and discharged if possible, their admission lasting only a few hours. The unit described in the article provides such a facility and thereby improves quality of care substantially, but I note the number of admissions has not declined since it opened. This is in contrast to the unit opened at Leicester Royal Infirmary Children’s Hospital (LRICH), in March 1994. This is probably the biggest unit of its type in the country. LRICH covers a child population of 209 000 children under 16, resulting in large numbers referred for admission (average of 35 per day in December 1996 and maximum of 50 on one day of the same month). The aim of the unit was to rationalise admissions by ensuring prompt treatment and transfer to the ward where admission was required, and to allow children to return home the same day wherever possible, thus reducing pressure on beds. Our unit has demonstrated a considerable reduction of overnight stays and greatly improved efficiency of working practise. The unit was initially open 0830 to 2230 hours Monday to Friday. In the first year, 7208 children were referred for admission, 89% by GPs and 11% by the accident and emergency department. A total of 5452 children were seen on weekdays (paediatric admissions unit open), of whom 1799 (33%) went home the same day, while 1756 children were seen at weekends (unit closed) and 409 (23%) went home the same day. A total of 3855 children were seen via the unit (0830 to 2230 hours), and of these, 1542 (40%) were able to go home. This reduction of overnight stays has markedly reduced pressure on both medical and surgical beds. Children are seen much more quickly by nurses (immediately on arrival) and by doctors (90% within 30 minutes). The unit has been so successful it has been opened at weekends since May 1995, and may open all night in the future. Rapid follow up clinics contributes to ambulatory care. The clinics described in the article enable GPs to seek rapid appointments. Helpline calls can be triaged into urgent and less urgent appointments. Communication between GPs and hospital is improved. However, at a rate of only one child to be seen every other day, I wonder if this is a cost effective way of using consultant time? The Leicester paediatric admissions unit runs rapid follow up clinics with similarities. They occur three mornings per week, staffed by senior paediatricians and about six children are seen per clinic. Most referrals are children who were referred to the unit for admission but were able to go home the same day, while requiring further paediatric review. This provides an alternative to the registrar on-call who does not have to choose between finding a slot in overbooked consultant clinics and admitting the child. Children can be seen within one or two days. We also have a GP helpline which is available every weekday, 1100 to 1200 hours, and is manned by the doctor doing the clinic, during the clinic. Advise or appointments are offered as necessary. In one year, 556 children were seen at the clinic, 55% of whom were referred after a referral to the paediatric admissions unit but not admitted and 14% came via the GP helpline. Most children could be discharged after one or two visits to the clinic. A day care unit has also been set up in Leicester to provide elective procedures such as jejunal and liver biopsy, endocrine tests, and computed tomography with or without general anaesthetic; or follow up after a ward admission. This takes further pressure off acute wards. In 1996, 1573 children were seen, of whom 272 had procedures carried out. It is important for paediatricians to have an input here, especially if the accident and emergency staff are not paediatric trained as is the case in most UK hospitals. Nurse practitioners who can treat and discharge patients themselves using carefully written protocols may become available in the future. GP clinics in casualty have been found to be effective in some hospitals, and I think there is a place for health visitor clinics. This is a great asset to any paediatric unit and plainly the team described in the article has helped reduce hospital admissions substantially while providing high standard of care at home for children. Many units have specialist nurses for chronic diseases, but I would like to see more devoted to general, acute illnesses. Length of stay of inpatients could also be reduced if such nurses were available to visit after early discharge. Good communication is essential for the satisfactory functioning of home care. Innovative ideas in the article include sending parents a copy of letters to the GP and informing parents of normal results by phone, thus freeing clinic time. However, some parents may wish to discuss the child again even if the results are normal. Leaflets on common conditions are a very useful adjunct to treatment if the admission lasts only a few hours, enabling the parent to read in their own time about the illness. Our paediatric admissions unit provides many such leaflets and they are given to all parents of children with acute problems such as gastroenteritis, upper respiratory tract infection, febrile fits, asthma, and many more. Same day discharges from the Leicester paediatric admissions unit are often given the unit phone number in case of further problems. Standardisation of management is important where there is rapid turnover of junior doctors. In Leicester we developed a book of guidelines for management of common paediatric problems which is available on every ward. It was created by consensus of consultant staff, is updated regularly, and is available on disc to anyone who wants their own copy. A large part of paediatric work remains the acute admission of children with short lived illnesses. Many of these can be managed in a short admission of hours rather than days, so long as facilities for adequate follow up are available. This innovative type of care is offered by the units of North Middlesex Hospital and Leicester Royal Infirmary, and I look forward to further developments in this area in the future. (1991) Patient’s charter. (HMSO, London). (1991) Welfare of children and young people in hospital. (HMSO, London). (1991) Just for the day: children admitted to hospital for day treatment. (Caring for Children in the Health Care Consortium, Bristol) . (Available from: 7 Belgrave Place, Clifton, Bristol BS8 3DD.). 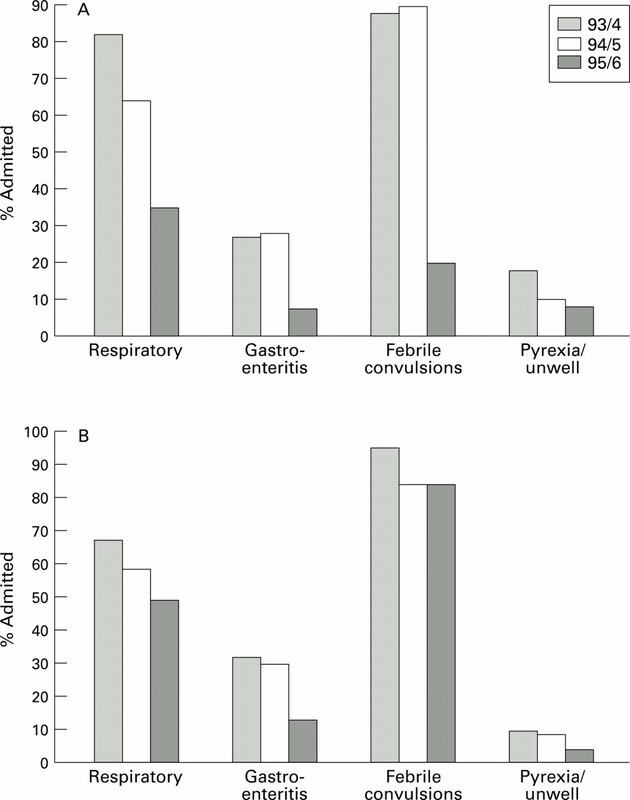 AMBULATORY PAEDIATRICS—A MORE FLEXIBLE OPTION? In the debate about whether ambulatory paediatrics should exist as a separate subspecialty confusion arises from the tendency to precisely define the word ambulatory rather than attending to the concepts portrayed through the term. For example the term community paediatrics is used to mean a certain type of service delivery, including the management of neurodevelopmental problems, child abuse, and promotion of child health programs. We do not get stuck debating the precise meaning of the word community even if we do not like term community paediatrics. If we did this we could easily decide that all hospitals are in the community, and all doctors are community doctors. It seems to us that for many paediatricians the discussion about ambulatory paediatrics has faltered at this level. To progress this debate it is important to look into the concepts advocated by proponents of ambulatory paediatrics and Dr Meates addresses these with clarity and enthusiasm. It could be said that community paediatrics is predominantly for the non-inpatient, care of patients with special needs; that hospital paediatrics is for the care of acutely ill children who have, or who may require inpatient care as part of their management; and that ambulatory care, could be care provided as a bridge between them and general practice. The major problem is in deciding who should carry out these different types of care: should it be by one, two, or even three different sorts of paediatrician, or by one doctor working in several settings in one locality. The answer will differ according to the needs of the local area, and it is most important to recognise the need for this flexibility in the development of services. This is particularly pertinent in districts where hospital and community services are in different trusts where direct competition for services can arise to the detriment of all services. This flexibility and creative, cooperative planning should allow the best use of resources and expertise as Dr Meates stresses in her practice. For example locally in Stockport the acute children’s services have been placed within the community trust. The paediatricians have divided their district into zones with each paediatrician having general paediatric follow up and community paediatric responsibilities for the patients in their zone. These paediatricians hold a rapid referral clinic by the consultant on-call for the day, with hospital admission prevented or early admission facilitated by the home care team of nurses. This department already runs an excellent ambulatory paediatric style of service without using the term. By contrast in our large children’s teaching hospital, with a large paediatric accident and emergency department and with busy specialty paediatric units, there was a need for someone to manage the semiacutely ill children over and above the usual on-call admitting team and so a designated ambulatory paediatric service was started. Dr Carol Ewing and myself were appointed as job sharing consultant paediatricians three and a half years ago with this remit. Dr Meates’ paper identifies quality issues around the running of the non-inpatient care in their hospital and highlights the benefits of having someone designated to take the overview of these. This questioning of the need for hospital outpatient review, the introduction of rapid response clinics, a telephone hotline and a home care nursing team were all identified as areas for improvement and innovation. Wherever ambulatory paediatrics is introduced these types of changes do seem to be repeated reinforcing the need for someone to be nominated to this role, whatever the title. The format of ambulatory care which we chose to use was of rapid referral clinics with patients being referred by GPs, health visitors, or clinical medical officers, or from the accident and emergency department. Of the 220 patients included in an audit of the first year of our clinic, the rate for patients who did not attend was low at around 5%. Twenty eight (13%) were admitted directly from clinic, with conditions ranging from meningococcal septicaemia, petrous osteitis, partially treated meningitis, to pyloric stenosis. This has reinforced our initial view that the clinic should be held in the accident and emergency department in order for nurse triage, and urgent resuscitation to be available if necessary. It is our impression that this service fulfills an unmet need for a number of patients not quite ill enough for immediate admission, and yet where the primary care team value the opinion and management of a senior paediatrician. The semiurgent nature of the referrals has also led to the development of our philosophy of a one stop ‘sort out’, with same day investigations and specialist opinion if possible, and to institute a clear management plan before the patient leaves. Investigations were carried out in 139 (63%) of patients on the day of the clinic visit. We give several examples of patients to illustrate this. A patient with craniosynostosis was referred to us because of parental concerns about the need for surgery. Within two hours a cranial computed tomogram and a neurosurgical opinion were obtained and the parents reassured. Another baby was found, coincidentally, to have an inguinal hernia. A surgical opinion was obtained within half an hour with operation on the next day’s list. The ability to arrange rapid investigations and opinions is because other colleagues recognise our service as being semiurgent. In 31% of patients other unrelated, and previously undiagnosed problems were identified indicating the importance of a thorough assessment by an experienced paediatrician. These included Turner’s syndrome, neurofibromatosis, α-thalasaemia, Tourette’s syndrome, and severe depression. Because of the potential overlap between services it is possible for many conditions to be treated by several services, and consideration needs to be given to this in the future to avoid unnecessary duplication. We believe that we are seeing an evolution in hospital based service delivery and that it will become the norm to have services where rapid referral for consultant/senior doctor assessment occurs, with rapid investigation and institution of treatment, perhaps with a short period on an assessment/short stay ward with early discharge to the home care hospital nursing team and liaison with community services as appropriate for each district. Freedom to adapt and change services to maximise resources and expertise must remain. Dr Meates’ paper is an important contribution to the subject. Meates’ paper ranges widely across the many organisational features of her service at North Middlesex Hospital which she has developed since her appointment as an ambulatory paediatrician. The main components are easy access by GPs to consultant opinion and outpatient appointments, a day assessment unit and a team of children’s home care nurses. Two factors have combined to make such approaches to service provision a major topic of interest in 1997. The first is the belief, strongly held by paediatricians, that children should be cared for at home with their families whenever possible. The second is the emphasis that management in the NHS has had to place on controlling costs when resources are limited, particularly by reducing inpatient admissions and lengths of stay. The day assessment unit performs several functions which in other hospitals might be split between an admissions unit or accident and emergency department, an observation ward, and a day ward. It is common experience that considerable numbers of children referred by GPs for a paediatric opinion. are managed by advice, appropriate treatment and discharge home, rather than admission to an inpatient bed. By concentrating such children into an area adjacent to the children’s wards, they are more likely to be assessed by experienced medical and nursing staff and can be observed in an area suited to their needs while the results of investigations are awaited. The attention of medical staff tends to be focused on such an area, so that decisions on management can be constantly updated and wasted time minimised. There is less disruption to the inpatient wards, where the presence of very demanding but less sick children can make it difficult to care for inpatients properly. Use of such a unit also helps to shape staff and parent perceptions of the care that the child needs to receive during this episode of illness. Once a child has been admitted into an inpatient bed, there is often a presumption that he/she will remain there until the next day or even the next consultant ward round. At Leicester, with 35 emergency admissions each day, a five bedded assessment/admissions unit, where children are clerked and investigated, fills a similar role. Forty per cent of the children referred there for admission are managed without transfer to an inpatient bed. Wolverhampton, Worcester and Kidderminster, among others, have similar arrangements. This type of unit could be set up in many hospitals, possible in a pre-existing children’s day ward, to the benefit of both children and paediatric staff. Meates’ description of an outreach nursing service that cares for acutely unwell children at home instead of admitting them to an inpatient bed parallels the development of similar services elsewhere. At Whiston Hospital, a ‘Children’s Hospital at Home’ was set up in December 1993 to care for children at home who, without the service, would have been admitted to an inpatient bed. The Whiston service is different from that offered in most places in that it offers up to four visits a day at any time during the 24 hours, either on a planned basis or earlier at a parent’s request. There are less visits on the night shift than during the day, but the availability of visits at night has proved important with less well children and where anxious parents would otherwise have returned to the accident and emergency department, finding telephone contact insufficient on some occasions. The ‘Hospital at Home’ nurses have the right of readmission of a child to the wards if they consider this is necessary. Interesting as Meates’ descriptions of her services are, she has not managed to show conclusively that a day assessment unit and home care nurses can reduce the number of bed days required for emergency paediatric admissions. It is always harder to see a clear effect when a service has been built up over a period of years, and Meates’ data suffer from this difficulty. All units who have introduced new ways of caring for acutely sick children must take responsibility for publishing the results of such changes on both the costs and benefits to the children for whom we care. (1965) A pediatric home care program in London—ten years’ experience. Pediatrics 36:314–321.